Can you help us answer a question that we’ve had for a good minute? Well, if you can, we were wondering what makes a pug happy… Random, we know, but ever since we saw this Happy Pug Adult Mask, we can’t help but wonder what puts those little guys in a perpetual good mood. Is it tennis balls? Treats? Going for a walk? See, we don’t know, but you could definitely help! All you would need to do is put on this mask! It’s that simple, and when you put it on, you will be able to get into the head of this cute canine. Once in character, you can finally tell us why pugs are so smiley all the time. 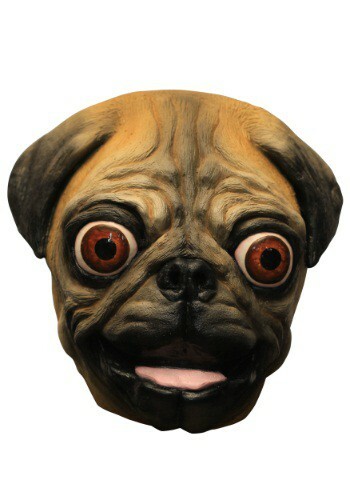 This molded latex mask will cover your face and top of head, but it won’t be able to cover your puggish happiness! However, the eyes of this mask will limit your range of sight, so don’t go chasing any cars!